Rakul Preet Singh has been roped in to play the role of late legendary actress Sridevi in NTR biopic. The highly anticipated NTR biopic is a talk of the town as the makers recently revealed the new title and release date of the film. The biopic has been titled NTR Kathanayakudu and is all set to release on January 9, 2019. The makers of the film shared the new title and released date on Twitter with a caption: “The story of a man who defined the word protagonist n the Telugu Cinema’s magnificent.” Everything about the film is grabbing attention. NTR biopic will have an amazing star cast. 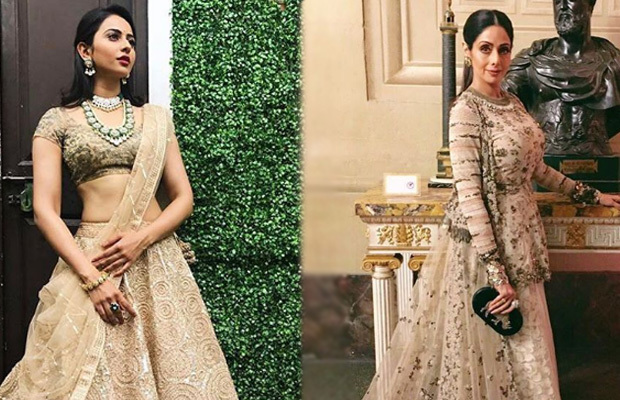 The makers have finally locked Rakul Preet Singh to play Sridevi in the film. The biopic will be made in Telugu, Tamil and Hindi since NTR was a popular figure across India in films and political circles. Being jointly produced by Balakrishna, Vishnu Induri and Sai Korrapati, the film will have music by MM Keeravani. Why in the world wouldn’t they rope in Janhavi to play her mother’s role. The semblance is striking, not to mention the opportunity to live a small part of her mother’s journey. seriously…some people just don’t like thinking. Why would her daughter want to play her… and romance the on screen Boney? What part of that do you not understand? It’s all for show and business on the outside but inside the girls are mourning their mother.